According to government figures, in the UK we throw away a staggering 8.3 million tonnes of food every year. That’s an annual average of very nearly 140kg – the equivalent of a fairly hefty 22-stone rugby player – for each and every one of us! Add to that all the grass clippings, dead flowers and plant prunings that even a modestly-sized garden can produce over the summer and before long, you’re dealing with an awful lot of green waste. The big problem with all this is that every tonne of green waste buried in landfill will ultimately produce between 200 and 400 cubic metres of landfill gas – rich in methane, which is around 30 times more damaging as a greenhouse gas than carbon dioxide. Quite aside of the issue of wasting all that food, the environmental benefits of keeping green waste out of landfills are pretty clear! These concerns were to lead the European Union to implement the 1999 Landfill Directive – after more than 10 previous years of debate and deliberation – and the reduction targets it ushered in were to change the face of waste management in the UK. Not only were there severe restrictions on the amount of waste that could legally be landfilled, but there was a strict timetable to go with them, setting the clock running on the necessary cuts. By 2020 at the latest, all EU states are required by law to have slashed the biodegradable waste entering landfills by 65 per cent of 1995 levels. For those countries which, along with the UK, have traditionally had a high dependence on landfills for their waste disposal, this was – and is – a huge challenge. The good news is that according to the latest local authority statistics, Britain looks to be well on the way to meeting it. The rise of council green waste schemes – and of composting in particular – has been one of the most important aspects in achieving this. 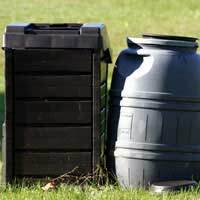 The Office for National Statistics reports that in 2008, composting accounted for the largest single element – more than a third – of household waste recycling in England. The compost industry within the UK has clearly come of age, with over 2.6 million tonnes of green waste – more than 2 million tonnes of which comes from households – being composted in centralised schemes every year. Interestingly, some local authorities are going one stage further and closing the loop by using the material produced in their areas themselves for municipal landscaping projects and the like. From Shetland down to Dover, it seems that councils and individuals alike are getting to grips with the problem of green waste. Never-the-less, not everyone has a convenient scheme on their doorstep – or necessarily wishes to join in, even if they do – which inevitably raises the question what can you do for yourself? One of the most obvious ways of keeping green waste out of landfill is not to throw away so much in the first place – which means being careful about not preparing too much food, ensuring you store things properly and keeping an eye on sell-by and use-by dates. Add to that a good “leftovers” recipe book and you’re pretty much there in the waste reduction stakes! That said, very few of us actually go out of our way to do what amounts to pouring money straight into our rubbish bins and if you’re a keen recycler, it’s probably a fair bet that you’re not going to be someone who’s wasting too much food in the first place. All the same, there may still be something you can do to help cut down on the green waste problem. Some amount of food waste is going to be inevitable, but home composting your peelings and egg-shells along with greenery from your garden can be a big help – with the added bonus of getting some material back to use on your flower beds. There are plenty of home compost bins on the market and a quick visit to your local garden centre should leave you spoiled for choice. It’s also worth remembering that from time to time many councils have free or subsidised offers to encourage home composting, so it’s definitely a good idea to see if yours is one before you splash out. Two of the biggest environmental problems associated with landfill – landfill gas and leachate – can be laid firmly at the door of biodegradable waste . The good news is that the efforts of everyone from individual householders right through to the lawmakers of the EU has made trying to keep green waste out of landfills a battle that is finally being won. More Environmentally Friendly to Use Glass Milk Bottles?